"I found it very interested ." Eggplant can be cooked using several methods, such as frying, stir-frying, grilling, broiling, baking, and roasting. When cooking eggplant be sure to cook it thoroughly. When cooked properly it will have a flavor of its own and will have a creamy smooth texture. 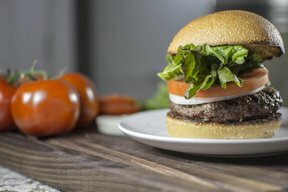 The eggplant can also be breaded to decrease the amount of oil it absorbs. When eggplant is to be added to stews or soups, it should be added during the last 10 or 15 minutes of cooking to prevent it from becoming mushy. Some instructions on how to cook an eggplant are shown below. Slice and salt the eggplant using the methods shown here. Heat oil until very hot but not smoking. 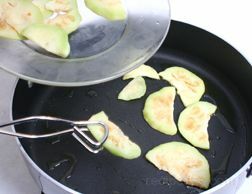 Use a non-stick pan and only 1 tablespoon or less of oil to prevent the eggplant from soaking up too much oil. Add the slices to the hot oil. 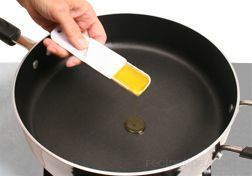 Place in the pan in a single layer. Turn the eggplant slices often while cooking. If cooking too fast, turn heat down slightly. Be sure not to turn down the heat too much. If heat is not hot enough, the eggplant will begin to absorb too much oil. 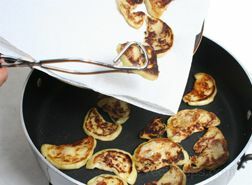 When the slices are a dark golden brown, remove them from the pan and place on a plate lined with paper towel. The paper towels will absorb excess oil. Season with salt and pepper to taste and serve eggplant slices while hot. 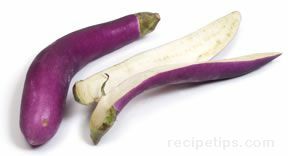 The smaller Asian varieties, such as the Chinese and Japanese eggplant, work well for stir-frying. Salt the eggplant as shown here and then cut into 1/2 inch cubes. Heat oil until it is very hot. Continue to stir as the cubes cook. Cook just until eggplant is a rich golden brown. 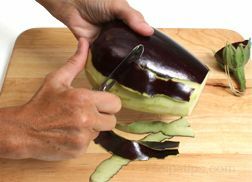 Cut into slices and salt the eggplant as shown here. Brush both sides of the slices with oil. 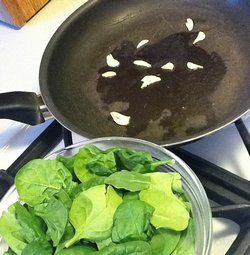 Grill or broil until slices are soft and cooked thoroughly. Pierce the skin with a fork to prevent it from bursting while cooking. Coat a baking dish with cooking spray or lightly grease. Place eggplant in the baking dish. Place in an oven preheated to 350°F. Roast for 45 to 60 minutes, turning once through cooking time. Roast until eggplant is very tender when poked with a fork. Cooking time will vary depending on the size of the eggplant. Remove from the oven and allow to stand until cool enough to handle. Peel the skin from the eggplant and then slice, chop or blend for desired use. When salting the eggplant, be sure to wipe the salt off after allowing it to sit. Do not wash the salt off because the eggplant will absorb the water. Larger or over mature eggplants will be more bitter than smaller just ripe eggplants. 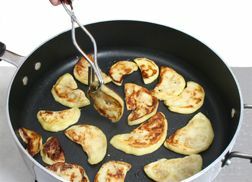 Eggplant equivalents: 1 medium eggplant = 1 pound, 3 to 4 cups chopped or diced (raw), 1 3/4 cups cooked. "Finding this information was perfect timing. I planted eggplant this year for the first time and they are just about ready. I have never prepared them before so I wasn't sure what I was going to do with them. This information is just what I need. Thanks!" "Some friends gave us an eggplant to try. I had no idea what to do with it. This information was really helpful. I didn't know how to cut it or that it needed to be salted to get rid of excess moisture. The "slice and salt" link at the top took me to info showing me just what to do. All this info was great!"